While celebrating its 20th anniversary, The Mary Kay Foundation℠ is awarding $3 million in grants to 150 domestic violence shelters in 49 states, the District of Columbia and Guam. Throughout Domestic Violence Awareness Month in October, each shelter will receive a $20,000 unrestricted grant to help combat domestic violence, educate local communities, and provide much-needed shelter and rehabilitation services. Coincidiendo con su 20o aniversario, The Mary Kay Foundation otorgará $3 millones en subvenciones a 150 albergues de violencia doméstica en 49 estados, el Distrito de Columbia y Guam. Durante el Mes de Concientización sobre la Violencia Doméstica en octubre, cada albergue recibirá una subvención de $20,000 sin restricciones para ayudar a combatir la violencia doméstica, educar a las comunidades locales y proveer de servicios de albergue y rehabilitación. DALLAS – Oct. 5, 2016 – While celebrating its 20th anniversary, The Mary Kay Foundation℠ is awarding $3 million in grants to 150 domestic violence shelters in 49 states, the District of Columbia and Guam. Throughout Domestic Violence Awareness Month in October, each shelter will receive a $20,000 unrestricted grant to help combat domestic violence, educate local communities, and provide much-needed shelter and rehabilitation services. While more than half of the grant recipients use the unrestricted funds for basic operating expenses, others hire much-needed personnel, complete repairs and facility renovations, or add programs and resources based on the unique needs of their shelter and the clients they serve. This year’s highly sought-after grant slate brings the total investment in The Mary Kay Foundation℠ annual shelter grant program to $38.6 million. Family Crisis Center in LaFayette, Georgia, is using its grant from The Mary Kay Foundation℠ to hire a part-time counselor who will work with domestic violence groups in the evening for women and teens residing in the shelter. The Caring Place Inc. in Lebanon, Kentucky, will be able to renovate the children’s playroom and playground as well as assist clients with their first-month rents and deposits. Carteret County Domestic Violence Program of Morehead City, North Carolina, plans to use its funds to replace the roof that is failing on their facility. Nearly 600 domestic violence shelters applied for The Mary Kay Foundation℠ shelter grants this year. The Mary Kay Inc. global cause-related initiative, Beauty That Counts®, helps support the Foundation’s annual shelter grant program. 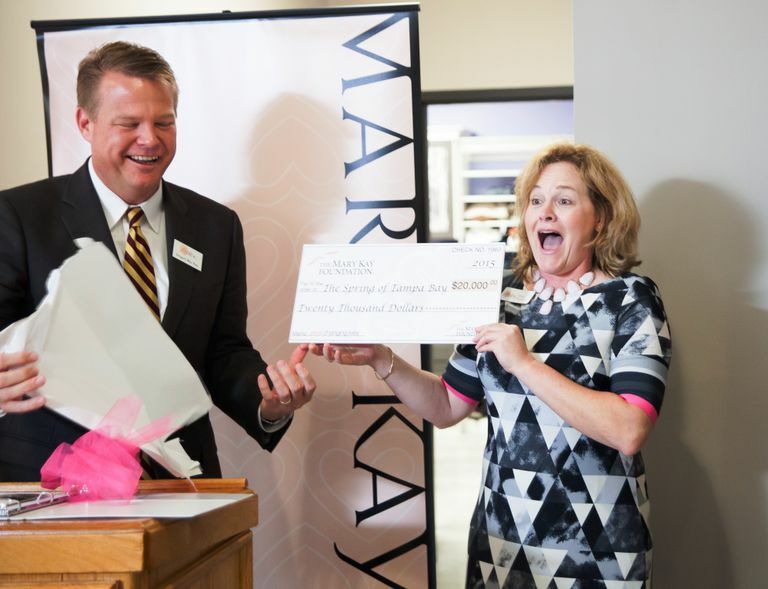 Mary Kay has a deep commitment to ending abuse and, together with the Mary Kay Foundation℠, has given $53 million to domestic violence prevention and awareness programs. Applications for the 2017 Shelter Grants program will be available Jan. 15 through April 30, 2017. Please visit marykayfoundation.org for additional information and for the full list of 2016 Shelter Grant Recipients. The Mary Kay Foundation℠ was created in 1996, and its mission is twofold: to fund research of cancers affecting women and to help prevent domestic violence while raising awareness of the issue. The Mary Kay Foundation℠ has awarded $68.9 million to shelters and programs addressing domestic violence prevention and cancer researchers and related causes throughout the United States. To learn more about The Mary Kay Foundation℠, please visit marykayfoundation.org or call 1-877-MKCARES (652-2737).